Capturing energy from the earth's heat is pretty easy pickin's for geologically-active areas of the world like Iceland, Indonesia, and Chile. In some locations, hot fluids are so near the earth's surface that heat from naturally-occurring hot fluids can be directly circulated through buildings for heating. Iceland, in particular, takes advantage of this low-hanging energy fruit. However, in most areas of the world where geothermal energy is captured, the heat is used to generate electricity. Unlike some of the more common alternative energies - hydro, solar, and wind - geothermal is impervious to weather conditions. This independence means it provides excellent base load electricity. 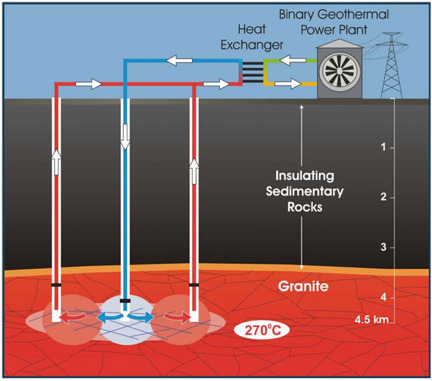 Currently all commercial geothermal electricity is generated by so-called conventional systems, whereby naturally- occurring hot water or steam is accessed at comparatively shallow depths in areas of very high geothermal gradient. Wells are commonly drilled to depths on the order of 2 km. The water or steam they produce is used to spin turbines that in turn generate electricity. The success and sustainability of a geothermal reservoir in large part depends on managing the reservoir. For a reservoir to be sustained, the natural and induced recharge of fluids must balance the produced fluids. Almost all reservoirs require the produced water to be re-injected in order to maintain reservoir pressure. Because naturally-occurring water and steam are necessary, potential development is generally restricted to areas near volcanic activity. But the geographic limitations of geothermal energy may be about to change - and create a much rosier picture for the future of geothermal energy. Conventional geothermal systems are possible only in relatively limited geographic areas. The real prize in accessing geothermal energy - and at a much larger scale - is through enhanced (or engineered) geothermal systems. In EGS, hot rocks are artificially fractured, commonly at great depths. Water is injected to contact the hot rocks and then produced back to the surface; the energy captured is used to generate electricity. These are very expensive ventures, with costs in excess of $10 million dollars as a starting point - ten times the cost of a geothermal well. Current EGS projects are still experimental, and most have substantial government backing. A relatively advanced EGS experimental system is currently underway in Australia. Here, granites producing high heat due to radioactive decay at depths greater than 3 km are seen as viable geothermal reservoirs. In South Australia alone, some 23 companies have filled licenses covering 110,000 sq km where suitable hot granite is believed to exist at accessible depths. Once such a plant is built, it will be tapped into a virtually limitless supply of energy that's available without cost, 24/7. Successful implementation of EGS plants will be the break-out technology for geothermal energy. A workable technology is one thing, and economic viability is something entirely different. 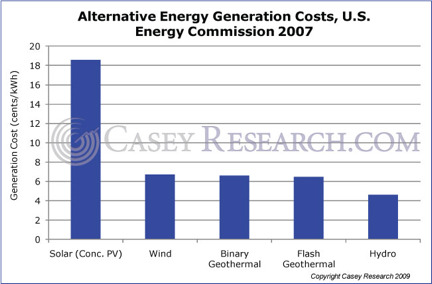 As you can see from the chart below, not all energy sources are created equal when it comes to cost per kilowatt-hour. In terms of production cost, geothermal certainly holds its own at 6.5 cents per kilowatt-hour - about the same as wind. Coal and nuclear power are still powering the way ahead with their 4-5 cent/kWh generation costs, but with natural gas at 7 cents and petroleum topping 10, geothermal has already proven itself to be a viable alternative, not only on the economic front but on the environmental front as well. Given the fact that geothermal energy is only a minor player in the worldwide picture for energy, why are we still bothering with it? Because in terms of economics, geothermal energy trounces solar and wind. Geothermal energy does not depend on weather. The sun doesn't shine around the clock or even every day; neither does the wind blow all the time. In contrast, hot rocks are there 24 hours of the day, seven days a week. The predictable amount of electricity makes it easy for geothermal companies to sign long-term energy contracts without worrying as much about underproduction or "wasted" production. Lower capital costs. Even though solar panels have gotten much cheaper to make, the construction costs of a large solar farm are still extremely high. Recent estimates place the cost of solar energy to be upwards of US$10,000 per kilowatt-hour (kW) whereas wind is around $1,700-$3,000/kW. Geothermal is similar to wind at US$1,600-$2,800/kW depending on location, though due to reasons 1 and 3, geothermal is economically superior to solar and wind. In fact, these numbers put geothermal on par with building a coal plant under the new requirements for carbon capture. Geothermal capital costs are relatively low for two reasons. First, there's no need to sequester, or capture and stash, any carbon emissions. This requirement alone can add 40-60% to fossil fuel projects. Second, geothermal power plants enjoy the best of both worlds: they require less land than wind and solar projects, and fewer permits than coal and nuclear because they're less hazardous. Higher load factor. Utility companies, and anybody buying power from them, have to consider load factor: the difference between nameplate capacity (how much the generator is designed to produce) and actual production. The smaller the difference, the higher the load factor, and the more money the utility will make. For a wind farm, the load factor is generally 30-40%, and even lower for solar farms. In contrast, geothermal power plants can generally operate near 90%, since, as we said before, hot rocks are always available. On an economic basis, geothermal has a virtually unique advantage among the "green" energies. Its power plants can compete with those fired by coal or natural gas even before any government subsidies. For geothermal operating companies in the United States, the government subsidies that Obama is showering upon the alternative energy sector are pure icing on the cake. And best of all, geothermal companies are virtually off the radar of most investors. For those keeping an eye on geothermal technology and geothermal companies, a window of great opportunity will open. 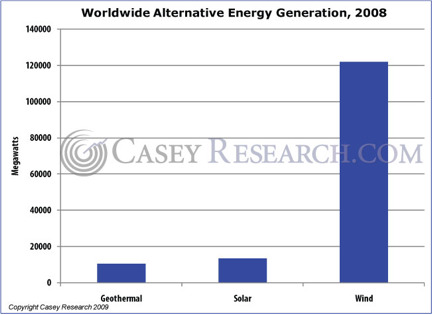 This kind of research is typical of Casey's Energy Report and its research team, led by Marin Katusa. And with a stock pick record of 19 winners in a row - a 100% success rate over 11 months - Marin's insightful research has made a great deal of money for his subscribers. As a special year-end offer, we have drastically lowered the price of Casey's Energy Report - but only until December 18. Sign up for a 3-month trial today and receive 40% off the subscription price PLUS a free holiday gift! Click here to learn more.